In our professional team you may find instructors with many years of experience as well as couches of parachuting representation team. Our tandem masters were the first of all in the Czech Republic who gained the authorization to carry out tandem jumps. We emphasize quality and individual approach to our customers. Thanks to that many years of experience we are able to constantly improve our service. When not doing tandem jumps or training first time skydivers, our instructors actively pursue their parachuting sport careers, participating in parachuting contests at home as well as abroad. Our company, Odyssey Group, provides and mitigates professional service in the area of parachuting including instructing activities. We are the only company in the Czech Republic that can assure tandem jumps for you at any chosen airport where our instructors and partners operate. Thanks to this fact our gift certificates grow in flexibility – you can redeem them practically anywhere. 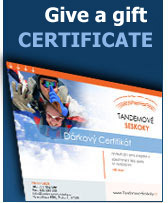 Promotional skydives anywhere in the Czech Republic. You can order skydives to promote your company or as a part of any social or cultural event. Our parachutists can jump with a flag, banner, or smoke candle. Skydivers are always a welcome surprise at any occasion. Do not hesitate to contact us for further info.